Resveratrol is a phytoestrogen which means it is structurally similar to estradiol, which is the major form of estrogen in humans. All of these phytoestrogens come from plants and may have many beneficial properties. This particular phytoestrogen is derived from a few different plants, most notably grapes and Chinese knotweed. Resveratrol is also found in red wine which uses the grapes in its production. That’s the reason some doctors suggest drinking a glass of red wine occasionally as it has healthful properties. Resveratrol is an antioxidant, which means it stops free radicals, which are thought to cause some cancer and ageing symptoms. Free radicals have also been implicated in a number of other diseases like schizophrenia and Parkinson’s. Not all free radicals are bad, but an over abundance of these highly reactive chemicals could prove to be very unhealthy. 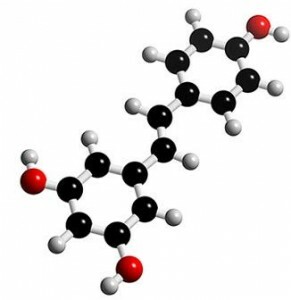 Resveratrol slows the reactions of free radicals with other parts of your body, such as DNA. This is very good because if the free radicals react with your DNA it can cause mutations which can cause cell mutation or cell death.